Available in hundreds of fabric choices, this sofa can also be customized to create a look that you are sure to love. The upholstered sofa features mission styled slats and a traditional three-over-three design (three back cushions over three seat cushions). A dark Pecan stained frame contrasts its upholstery counterpart creating a unique, soothing sofa suitable for most any home. The Westney Upholstered Sofa by Best Home Furnishings at Walker's Furniture in the Spokane, Kennewick, Tri-Cities, Wenatchee, Coeur D’Alene, Yakima, Walla Walla, Umatilla, Moses Lake area. Product availability may vary. Contact us for the most current availability on this product. Arm Exposed wood arm, finished in distressed Pecan curves and has slats the connect the arm piece to the legs. Leg or Skirt Exposed Wood Base and Legs. 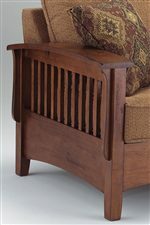 The Westney collection is a great option if you are looking for Cottage furniture in the Spokane, Kennewick, Tri-Cities, Wenatchee, Coeur D’Alene, Yakima, Walla Walla, Umatilla, Moses Lake area. Browse other items in the Westney collection from Walker's Furniture in the Spokane, Kennewick, Tri-Cities, Wenatchee, Coeur D’Alene, Yakima, Walla Walla, Umatilla, Moses Lake area.